Jean-Siméon Chardin was born in 1699 in Paris, the son of a cabinet maker. He spent his entire life in Paris. His first wife died in the fifth year of their marriage. Both of his daughters died young, one at the age of three one at the age of one. His son, Jean-Pierre, also a painter, was kidnapped for a time by English pirates off the coast of Genoa, and drowned in a canal by his own will in Venice in 1772, at the age of 41. That same year Jean-Siméon Chardin had kidney stones. In the hierarchy of genres, which was broadly accepted in the 18th century, history painting was ranked the highest, followed by portrait painting, then genre painting, then landscape painting, then animal painting, and then Still Life. More than anything else, Chardin painted still lifes, often very slowly, and often at a very small scale. He painted wicker baskets, plums, breadcrumbs, pewter dishes, grapes, a silver goblet, glasses of water, a pestle and a mortar, walnuts, pewter jugs, earthenware pitchers, flasks, dead partridges, dead hares, dead salmon, dead rays, apples, Seville oranges, dead mallards, onions, leeks, turnips, straw, chestnuts, more knives, teapots, apricots, olives, wild strawberries, white carnations, coffee pots, a copper cistern, stone ledges and white tablecloths. In 1728 Chardin was accepted into the Académie Royale de Peinture et de Sculpture. In 1742 he was quite ill and neither finished nor exhibited any paintings. In 1757 he moved into the Louvre, where he would spend the rest of his life. In 1770 he became the first painter to the king and the director of the Académie. He died on December 6, 1779 at the age of 80. In his estate he held approximately 5,638 livres of furniture. Audrey Melville Barker had the seventh exhibition at Lisson Gallery, in London, from 1-30 December 1967. In a review of the exhibition in The Observer, Nigel Gosling wrote “The English would seem natural practitioners of the eerie art of the ‘Magic Box’ like those of the American Cornell. But few do, but several of Audrey Barker’s ‘Compartments’ have the right fragile mystery.” Earlier that year, Barker visited Joseph Cornell in Utopia Park, Queens, New York and he gave her two of his boxes. Barker was born in London in 1932. Tuberculosis contracted during the second world war, led to eight years of childhood in a hospital, lasting bone damage and arthritis. She made little work in the 1970s due to illness. She purchased and restored a mill which she developed into an art space and shelter for persons with disabilities. She refused invitations from the ICA in London because of a lack of proper accessibility to upper galleries. Barker’s work ranged from doll making to painting to exhibition organising, often focusing on alternative sensorial modes of communication. At an exhibition she conceived in 1997 at the Blackie Gallery in Liverpool, a fax machine was installed, on which visitors corresponded with Barker. These faxes were then displayed on the walls of the gallery. 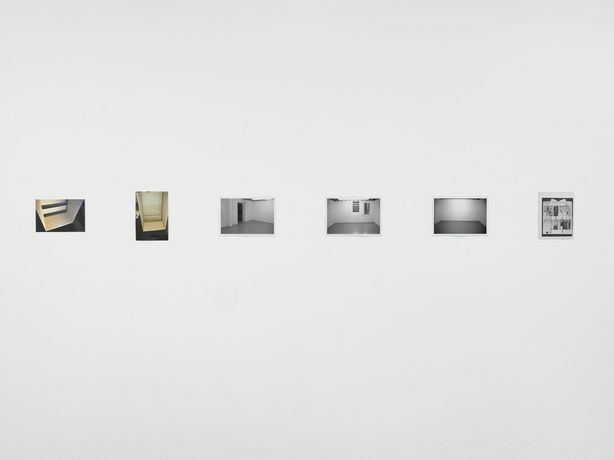 In 1973, there was another exhibition at Lisson Gallery, by an American artist, which took place in the basement.